Made for Hubby's best friend's new baby boy. As soon as they announced they were expecting my Hubby informed - not asked - me that I would be making a quilt. Rather than take offence I gave myself a pat on the back that he appreciates this gift as much as a recipient. And this little quilt is now in the baby boy's hands. The whole quilt came together quite fortuitously. 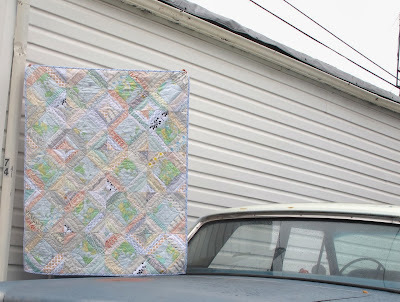 I used the map fabric I had left from this quilt. The couple who are parents of this baby boy are world travellers. In my imagination I live vicariously through the adventures they've had. Hubby actually picked that fabric when I decided I would use this block as the basis of the quilt. 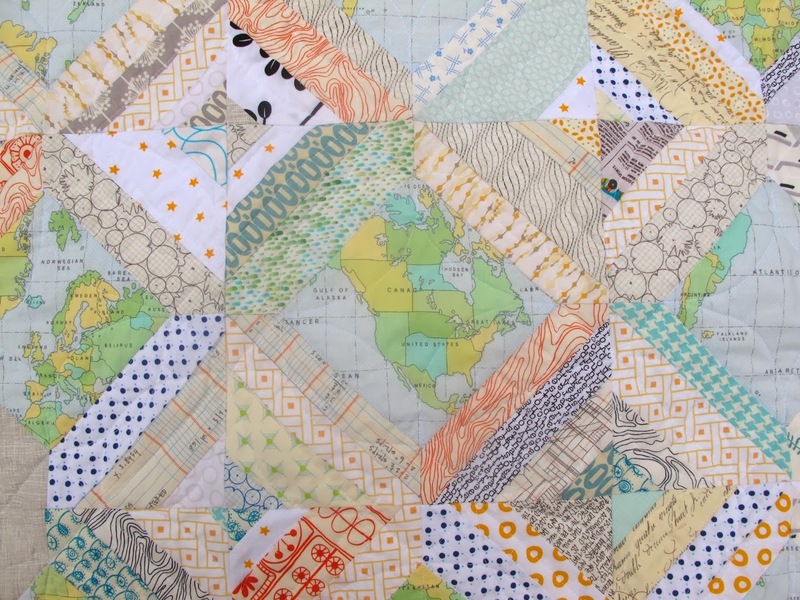 In addition to the map fabric I used a variety of low volume prints in blue, green, yellow, gray, and orange. Some of the prints were even from the couple's wedding quilt! The map fabric is a little odd as it isn't exactly geographically correct. This is not what Canada and the US look like! But the outside borders are there. If I cared to research things in the history books I'm sure I could find a year to associate with this geography. For now, we all get the idea. The quilting is done with Aurifil 50W in white, as was the piecing. It is a combination of grid work and dot to dot curves around the map sections of each block. Together, it creates a wonderful texture. This is Hubby's other contribution to the quilt. He insisted that one block with Australia be placed upside down. Sure, whatever. Finally, when it came to selecting backing fabric Hubby stepped in. He and his best friend have always bonded over cars. And indeed, this guy works at a car dealership now. So the car print was the only choice! I guess it really is a travel themed kind of quilt. One day the world will be his to explore. I love how the overall effect is subtle but there are still so many details to see. Great fabric choices! I love how involved your husband was, especially the not asking - too cute! It has a lovely muted quality from far away but so much texture and richness. The up close shots show why! Lucky baby! Just perfect for a sweet newbie to this world. Love the colors. 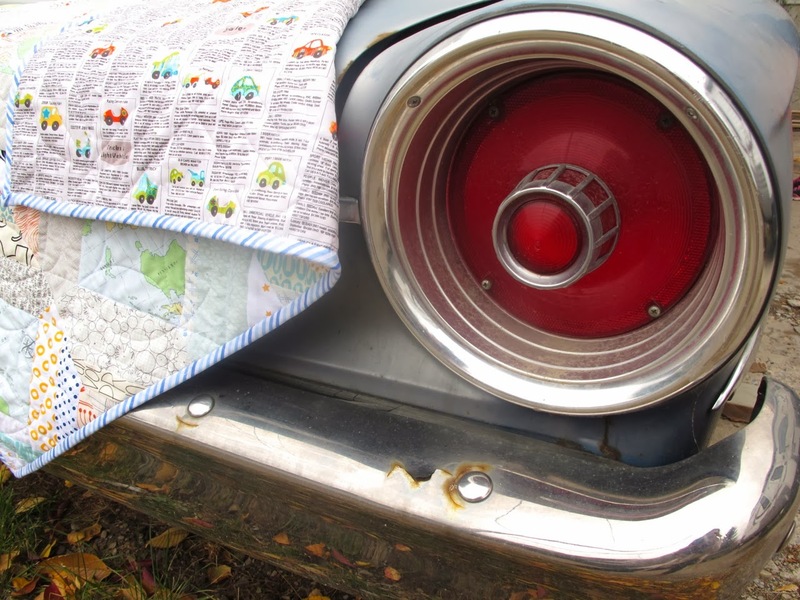 Love all the colors and the textures the fabrics add to the quilt. So very pretty and perfect for a little boy. I love the overall palette that this quilt has and the name is inspired. A lovely gift. 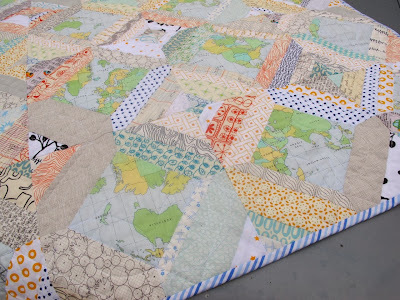 I love string quilts and the map fabric is perfect! Got your book and just waiting for a minute (like now) to sit down and look. I love the subtle palette and how your fabric choices were tailored to the family. A really lovely gift! 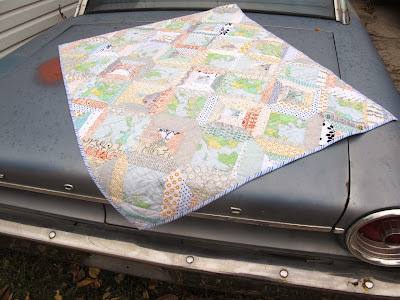 Really like the fabrics and travel theme going on in your sweet baby quilt. The little cars on the back is just right too. Saw you at Market but didn't get a chance to introduce myself. My first time and I loved it all. Great quilt! I have a yard of that same map fabric! It looks great with the low volume prints. Haha I picked that Australia was upside down before I read it! Have your friends travelled down here? So many of my friends and family have travelled to Canada, but I have not yet. I really like the block design you've chosen for this quilt. 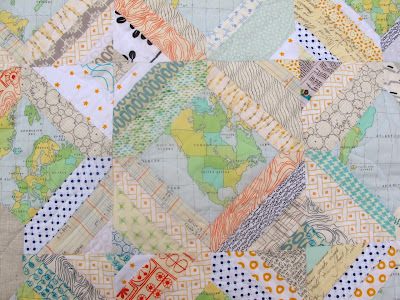 Adore the map print and the quiet, overall calm, of this quilt. It already looks faded and loved.